← Off on an Adventure? And, A Tree Grows in the Treehouse…. That’s not weird, is it? Dr Gwyneth Evans is disarmingly charming as she greets me. I’m a bit breathless from the ferry trip over to Bainbridge Island, and the following drive took me down lots of winding roads. When I finally get to her cottage, she’s sitting on the front doorstep, vaping and reading a book. Once we’re inside, she invites me to have a look around. Once we’re inside, she invites me to have a look around. My photographer is having a field day with all the first editions of classic science fiction and fantasy that grace the bookshelves, but I’m more interested in where it all came from. “So you’re a painter as well?” I examine the large framed work on the bare wall to my left. “Six,” she says without missing a beat. By this time, we’re comfortably ensconced on her couch. We move to the bookshelves, where she proudly shows me some first editions she’s collected. “Tell me about this photograph,” I say, gesturing to the one on the back wall next to the drafting table. “What about John?” I asked. “We’re lucky you did, too,” I reply. Once again, Dr Evans looks a bit wistful. Her phone rings; it’s her World Con liaison, saying he’s about 5 minutes away by car. “Well then, that’s all the time we have,” Dr Evans says briskly. “I need to stuff a suitcase and pack my laptop. Marisol will be cross with me; I said I’d be ready in plenty of time. “See you at the World Con!” I say. “See you at the World Con!” she responds. And that’s what it’s like to spend an hour with Dr Gwyneth Evans. I’ve attached her World Con schedule to the bottom of this article, so you know how to find her this weekend at the 104th World Science Fiction Convention in downtown Seattle. by Chrissie Sanderson, for The Stranger, Seattle’s oldest online arts newspaper! * I have rarely been so excited about a new line of skins before, but Mallory Cowen of LAQ has created Gun, an aged skin, on the heels of an ageing tattoo that actually works and looks good and comes in various intensities! Well done, Mallory— this skin inspired a story of an alternate Gwyneth and an alternate world for her altogether. Thank you for making such cool stuff! 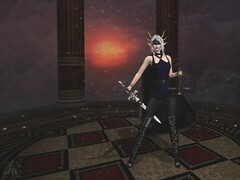 This entry was posted in A second life in pictures, Gwyneth, Not A Fantasy Fashion Blog! and tagged EarthStones, Ingenue, LAQ, OK maybe it's a fantasy fashion blog...., Poetic Colors, Truth, Valentina E. Bookmark the permalink.